In extreme conditions & high temperature it is especially important to have piping materials that resist wear to corrosion, oxidation, and high temperatures. The Inconel 60 answers the bell with supreme corrosion resistance to go along with heat-resistance and freedom from aging. 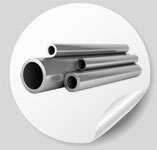 Among Inconel Alloys specifically the Alloy 600 is a nonmagnetic, nickel-based (72%) alloy also containing chromium (14%), iron (6%), and other trace compounds. These super alloy 600 products provide a perfect mesh of corrosion and heat resistance that makes them an ideal solution for a large number of industries. Some typical applications of the 600-800 series include many in the heat-treating field. Strength and oxidation resistance at high-temperatures make these bolts a viable option in mufflers, retorts, hearths, and many furnace components. The properties of Inconel 600 also make it a desirable products in the chemical industries. Some common applications include within heaters, in stills, distillation towers, evaporator tubes, flaking trays, and other instances that require the processing of acids and sulfides. A further example of the alloys versatility is its use in the electronic, aeronautical, and nuclear industry among others. From engines to exhaust and a variety of other applications where heat, water, or acid is constantly present the Inconel 600 alloy stand strong. The main advantage of the 600 alloy is the high chromium content which helps to raise the oxidation resistance significantly higher than that of pure nickel. The high nickel content conversely gives the alloy high corrosion resistance even as surrounding conditions escalate. The alloy 600 has tested high for resistance against salt water, gas from exhaust, organic acids, and physical stress which makes it a great compound for bolts and other fasteners exposed to those conditions. Alloy 600 is not an age hardening alloy; cold working is the only available means of hardening. Softening by annealing begins at about 1600°F (871°C), and is reasonably complete after 10 to 15 minutes of heating at 1800°F (982°C). Above this temperature, grain growth may be objectionable, although very brief heating at 1900°F will cause complete softening without undue grain growth. Since the rate of cooling has no effect on the softening, the material may be water quenched or air cooled. Low sulfur reducing furnace atmospheres should be used in forging. Major hot working should be done between 2300/1850°F, while light working may be continued as low as 1600°F. No hot working should be attempted between 1600/1200°F due to lower ductility in that range. Alloy 600 is machinable in both the hot worked and annealed conditions. Because considerable heat is generated in machining this alloy, high-speed steel, cast nonferrous or cemented carbide tools should be used. The tools should be kept sharp. Sulfur-based oil should be used as a lubricant, but should be completely removed before the machined part is exposed to elevated temperatures, as in welding. In what applications is Incoloy 800 used?